Part 2 Edmonton: Hot Yoga, Fitness and Farewells. 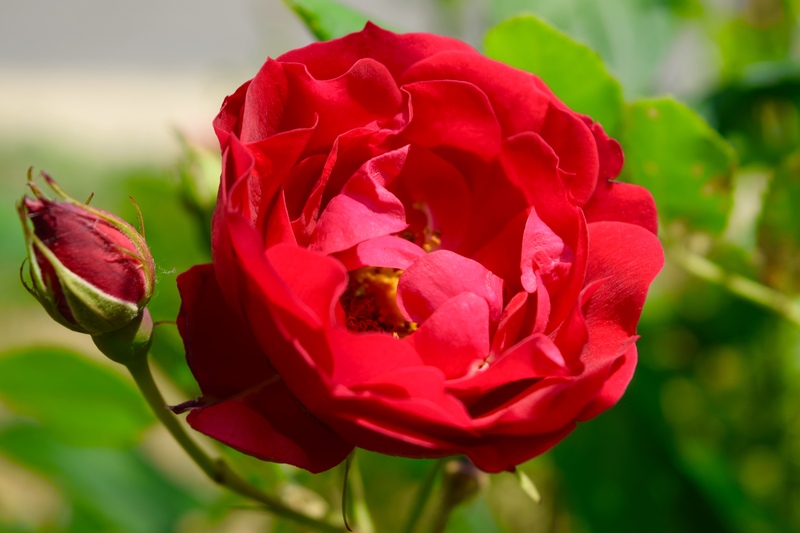 A beautiful red rose I came upon on my travels. Yoga and swimming are two of my favourite activities. On my very last day in Edmonton, the sun was shining and I felt great. I had been managing to keep up my fitness and good health routines while I have been travelling which is great. I might dedicate a whole post to this as I am sure many out there would like some tips on that one right? In the morning, I made my way to this awesome fitness centre called Millenium Place. I was so impressed with this facility! They had a big swimming pool, 25m in length and very wide to cater for the aqua aerobic classes. There was a massive gym and weights area, and even an ice skating rink! It was amazing! If I was in Edmonton any longer I would have gone again to try out the skating. I had a great swim and could use all the free equipment sitting by the side of the pool, like flippers, buoys, and kick board. I then went up to the gym and pumped a few hand weights. Weights are not normally my thing, but I am getting more into strength training lately. And then… I made my way over the road to a hot yoga session at Moksha Yoga. I loved the hot yoga! What a work out! I was concerned the room would be too hot and overbearing, but really it was the perfect temperature. I eased my way into all the poses throughout the lesson, copying the more experienced participants around me with envy. I really enjoyed the heat, it helped push me into poses easier, and the sweat trickling down my back was pleasantly satisfying, I was working up a sweat!! This particular style of yoga is not all that difficult, or gruelling, it is a good level of challenge, aiming to perfect poses with strength, stamina, peace of mind and focus. Yoga has really helped me to calm my mind and get more grounded into my body. I highly recommend it. 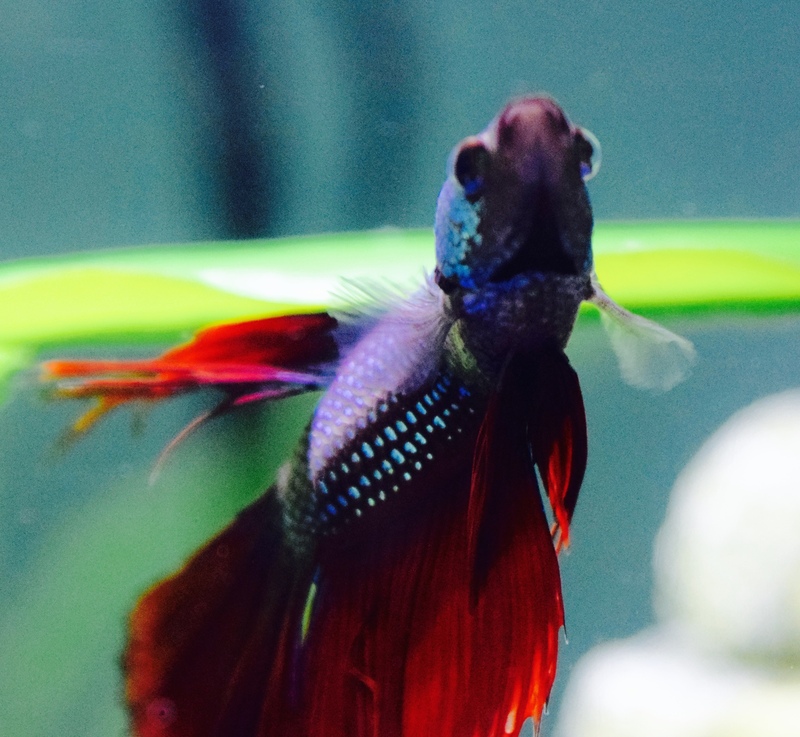 The pet fish ‘Sushi’, she seemed very intelligent watching our every move as we gawked at her through her fish tank! 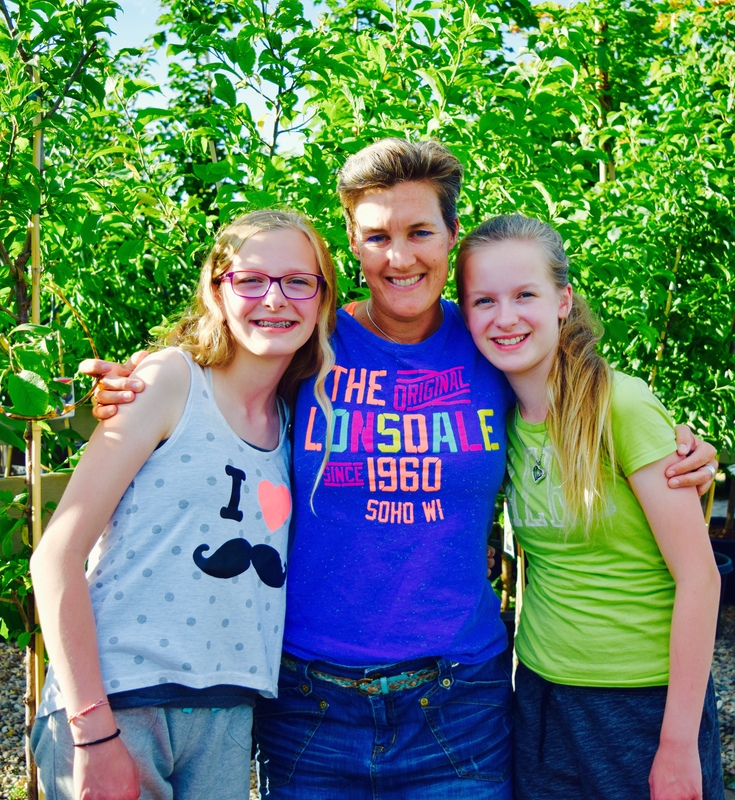 On the last evening, the girls arrived home from a school camp. They were so tired, but full of fun stories about their camp experience. After a shower and a rest we were all ready to go out for our last meal together. We went to this really nice restaurant called Branches nestled in a garden nursery. As we sat under a big embracing umbrella outside in the garden setting, we admired the green plants around us and the late warm evening sun. We all ordered different food but the same sparking blackberry sodas. So fresh and revitalising! my main meal arrived with a grand sweep onto the table. It was so pretty I had to take a photo! My delicious salad! SO fresh and and tasty. I have become one of those people who take photos of their food, but when it is so visually appealing it is an easy reminder. 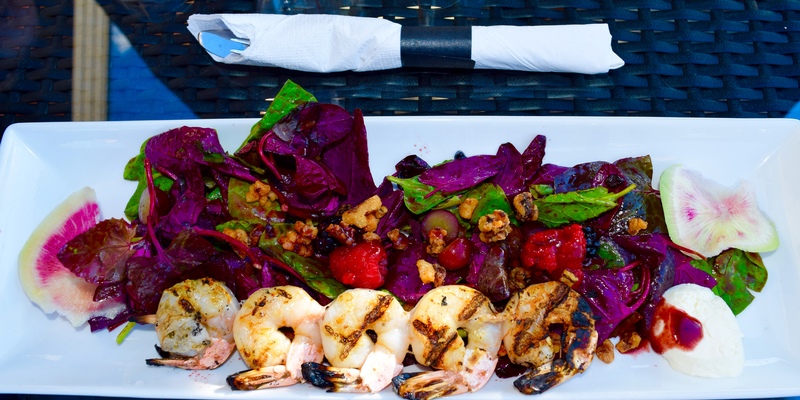 Crunchy candied walnuts, garlic prawns, frozen grapes and fresh raspberries, this salad was out of this world. A very tasty and fresh combination, leaving me feeling light and satisfied. We were all happy with our meals and walked around the nursery briefly before heading home one last time. When we made it home, it was time for one more game of Rumi Kub! I had a bought the game for the girls and they all enjoyed playing. They picked up the tricks well, I think I have found some new victims! Mwah haha! They will be addicted soon too I imagine! These gorgeous girls! Sammy and Emily such lovely girls! And good sports, playing games with me! 🙂 I have converted more Rumi Kub players, mission accomplished! My stay in Edmonton was awesome. I loved seeing my good friend Nay, and spending quality time with her and her gorgeous family including her delightful dog Izzy, it all was a real treat for me. I continued to play with Izzy as much as I could every day, throwing ball for her, brushing her and giving her lots of pats. She was so easy to please and it was so nice to see her happy. If only humans could be so easily pleased right? Catching up with friends from the past is so great! It was so nice to see my friend from so long ago, and to meet her lovely daughters for the first time. No doubt I will be back at some point in the future. Who knows how my life will look then? I am loving my travels so far, I seem to be in a very comfortable groove and routine of travel now, and I feel very grateful and happy for the time and many opportunities presenting as I continue to galavant around the globe. Travel makes you learn, adapt and experience amazing new adventures every day, I love that!